No Wonder He Was Weary. Monday, the 24th of November , was the last day that he spent on earth. That morning he could not be persuaded to lie in bed, but, though unable to stand alone, rose between nine and ten o’clock, and put on his stockings and doublet. Being conducted to a chair, he sat about half an hour, and then was put in bed again. In the progress of the day, it appeared evident that his end drew near. Besides his wife and Richard Bannatyne, Campbell of Kinyeancleugh, Johnston of Elphingston, and Dr. Preston, three of his most intimate acquaintances, sat by turns at his bed-side. Kinyeancleugh asked him, if he had any pain. “It is no painful pain, but such a pain as shall, I trust, put end to the battle. I must leave the care of my wife and children to you (continued he,) to whom you must be a husband in my room.” About three o’clock int he afternoon, one of his eyes failed, and his speech was considerably affected. he desired his wife to read the fifteenth chapter of the first epistle to the Corinthians. “Is not that a comfortable chapter?” said he, when it was finished. “O what sweet and salutary consolation the Lord hath afforded me from that chapter!” A little after, he said, “Now, for the last time, I commend my soul, spirit, and body (touching three of his fingers) into thy hand, O Lord.” About five o’clock, he said to his wife, “Go, read where I cast my first anchor;” upon which she read the seventeenth chapter of John’s Gospel, and afterwards a part of Calvin’s sermons on the Ephesians. 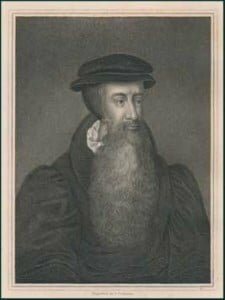 The Life of John Knox, by Thomas McCrie, p. 130.
it is the Lord God who raises up His faithful, humble servants and employs them in powerful ways to advance His kingdom. Pray that He would yet again shake the kingdoms of this earth with the fervent preaching of His glorious Gospel. Our God has done this time and again in the past, and He can and will so move yet again. Are you so praying and watching expectantly?